More than six hundred thousand tourists flocked to Hawaii in April this year. While a few flew in for work, most of the guests were here on vacation. Their motives were mostly similar: lie on a beach, soak up some sun, and go for a swim. At some point hunger drove them away from the beach toward a buffet of tropical edibles. And between the gluttonous cramming and food-induced beach comas, they will sometimes even procreate. Of course, these activities aren’t solely for people seeking a tan. 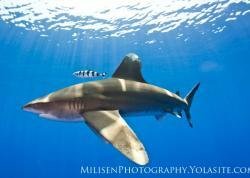 One of Hawaii’s most symbolic and photogenic creatures has made a lifestyle out of similar passions. Sea turtles have had a roller coaster relationship with Hawaii. Early explorers described seeing so many turtles that they were navigation hazards. As happens all too frequently, the human population in Hawaii exploded to the detriment of the local wildlife. Turtles were hunted to near extirpation until the state and federal governments put a stop to collecting and even harassment of such animals in 1978. Over the next few years, they multiplied. A lot. Today it is imperative to keep a lookout at the bow of a small boat moving through Kaneohe Bay lest a turtle pop up for a breath. They have become a staple of Hawaiian tourism and a symbol of the successes of proper management. 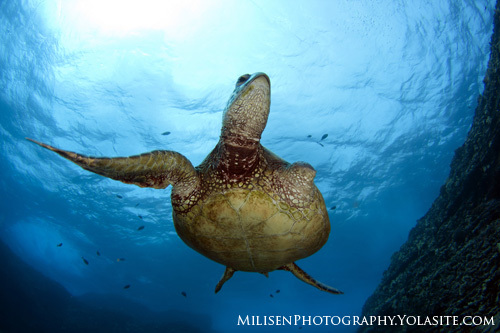 There is currently a movement to take green sea turtles off the threatened list. Thus, now seems like an appropriate time to appreciate these gentle, floating mega fauna. A honu proudly shows off a healed war wound at Portlock, Oahu. This animal was likely the victim of a tiger shark, one of the only animals equipped to consume full-grown sea turtles. Canon 500D, Tokina 10-17mm, 1/160, f/9, iso 200. Hawaii’s strict anti-harassment laws have brought the species back from the brink, but they still face many anthropogenic hazards. 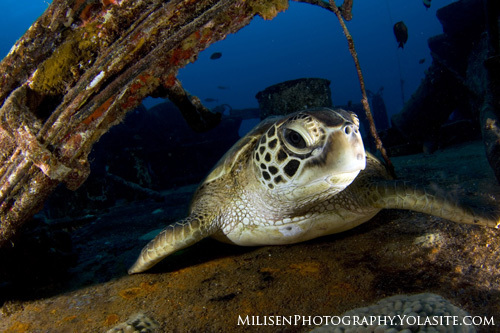 Boat strikes, poachers, and marine debris all claim an untold number of turtles every year. I’ve witnessed numerous examples of these hazards, but by far the most memorable was a turtle I came across under the ledge of a popular fishing spot. Its front flipper was connected to its head by numerous hooks and lines, pinning both extremities to its side. Reflecting on the same anti-harassment laws that saved Hawaii’s turtles, I nervously reached out and removed one hook from its head hoping that would resolve the situation and be on my way. The turtle swam around and approached me again, creating an extenuating circumstance by turning me into a cleaning station. As I was running low on air and the lines and hooks were mostly gone, I swam off with the turtle trailing behind as the most unique dive buddy I’ve ever had. 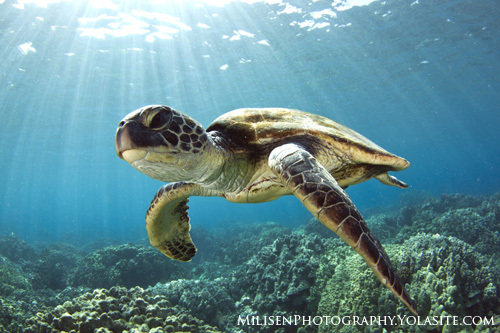 This article is taking a Hawaii-centric approach to the topic of sea turtles, which means we are mostly dealing with the abundant green sea turtles (Chelonia mydas). Greens, or honu as they are locally known, are the largest of the hard-shelled turtles reaching a maximum size of somewhere around 1 meter in length. 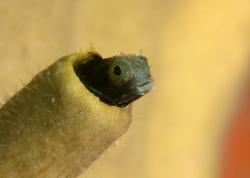 They can be distinguished from their other shelled relatives by having a blunt head and a beak without a hook. In discord with their namesake, green sea turtles are not especially green but are instead named for the green colored fat under their shells. 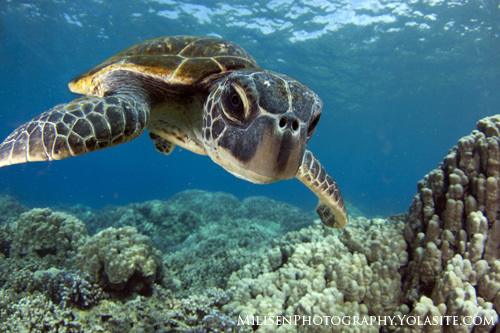 Unlike other sea turtles, honu eat mostly macro algae and seagrass. This turtle became so infatuated with its own reflection that I found myself having to swim away at times to keep from scratching my dome port. Canon 500D, Tokina 10-17mm, 1/160, f/8, iso 100. Green sea turtles are found circumtropically and are one of the most frequently encountered species in many parts of their range. The turtles in the Atlantic and the Pacific represent their own subpopulations. Major nesting sites exist on Ascension Island, Costa Rica, Hutchinson Island in Florida, the Pacific Coast of Mexico and throughout the Indo Pacific. Look for greens in shallow coastal waters foraging on seagrass beds where available. 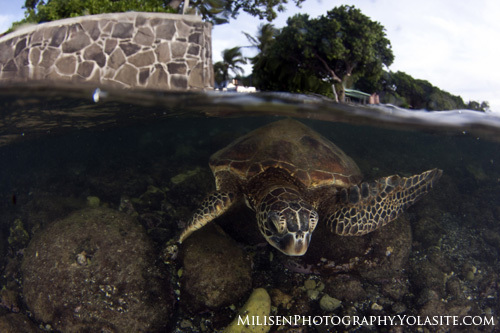 In Hawaii, green sea turtles are pretty ubiquitous. The key to any good photo is a compelling and willing subject, and the places that maintain a friendlier turtle population tend to be where they have had the most exposure to people. 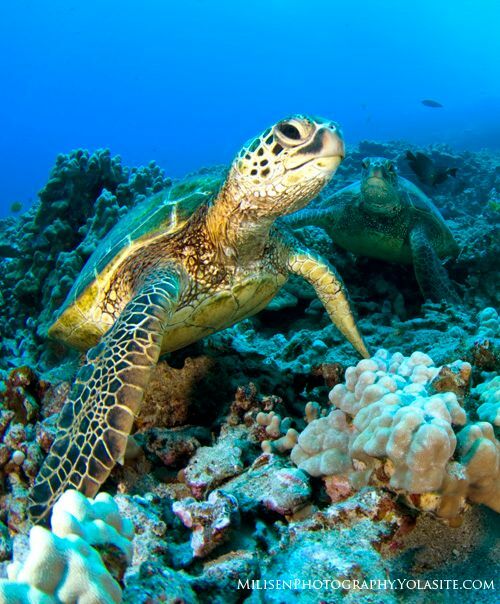 For example, the sites best known for harboring lots of relatively tame turtles on Oahu include Makaha, Hanauma Bay, much of the North Shore, and the boat accessible Turtle Canyon. Likewise on the Big Island, places like Honaunau, Puako and Turtles Reef are hot spots for cuddling up next to a honu and popular places to go for a snorkel. 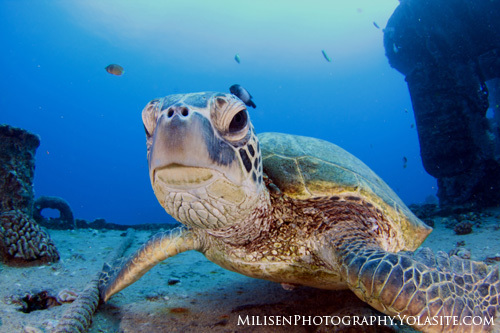 While these are recommended honu hideouts, nearly every dive site has a few resident turtles. A pair of Hawaiian green sea turtles resting in the coral gardens outside Sea Cave off the southeast side of Oahu. Canon 500D, Tokina 10-17mm, 1/100, f/8, iso 400. 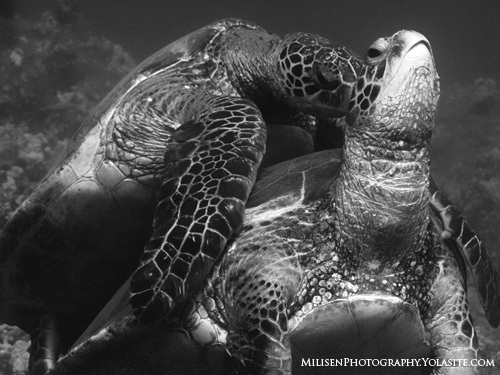 As with most animal photography, turtles need to be romanced into behaving for the camera. Take some time to get to know your subject before diving in for the winning shot. Underwater photography isn’t just about getting the exposure and composition right; the unique experiences are what drive the resulting imagery. 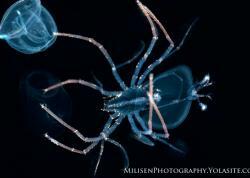 Most of these rules can be applied to any underwater subject that comes into focus. The best way to get a shot of a turtle’s tail is to swim after it. Head-on shots are better achieved through patience and playing to the animal’s inherent sense of curiosity. Approach slowly or better yet, let the animal come to you. As long as they aren’t spooked, they can often be entranced by their own reflection in the dome port. When this happens, set the shutter speed to fast and just hold down the shutter. Turtles can be deceptively difficult to shoot well. Anybody can point and click, but it takes real patience to put everything in the right place. Even if the subject is facing the camera and at the right angle (which it won't often do naturally), the front flippers can awkwardly block the head. When the turtle is being sociable, keep an eye in the viewfinder and a finger on the trigger. Remember, while faster dslr’s may take photos at a rate of ten pics per second, strobes take a few seconds to recycle. Use the artificial light wisely and hold off until the shot comes into view. It always helps to have a plan. Visualize the shot before entering the water thinking about the elements of composition, lighting, and exposure. Where do you want the subject? Are there other divers in the image? What are they doing? The more detail that goes into the plan, the better the final image will be. When shooting most nektonic animals, it is a good idea to shoot at an upward angle to separate the subject from the substrate. In this case, a snorkeler hovers excitedly over her first Hawaiian green sea turtle encounter at Kahe Point, Oahu. Canon 500D, Tokina 10-17mm, 1/125, f/9, iso 100. Often, the situation won’t unfold the way it was originally imagined, so instead of wasting the experience, use the added elements to create something exceptional. Did the plan call for a reflection at the surface but the seas are too choppy? Use the stormy water to create a dramatic image instead. Are there more people crowding the animal than expected? Document that. These unexpected elements are what help tell the story of your shot. Hawaii offers turtles protection from harassment. Harassment is defined as any action that alters the natural behavior of the animal, which means absolutely no touching or riding the animals. The wording on the laws is intentionally vague, so it is in the best interest of the photographer to be conservative in how they act around protected animals. Unless you are looking for a portrait/head shot, go wide or go home. But if the equipment in question isn’t any fancier than a point and shoot, don’t worry as turtles are fairly forgiving subjects. This image is the result of an hour spent gaining an animal’s trust. It took many minutes, but eventually, the turtle decided I was not a threat and swam with me for the remainder of the dive, affording me many opportunities to wait for the sun to be shining bright enough for the sunbeams in the background. Taken at Honaunau, Big Island. Canon 500D, Tokina 10-17mm, 1/160, f/8, iso 100. Split shots of static subjects are tough enough. Taking over unders of moving subjects requires lots of planning, even more patience, and a healthy dose of good luck. Puako, Big Island. Canon 500D, Tokina 10-17mm, 1/160, f/8, iso 400. A young green sea turtle pokes its head through the wreckage of a Navy LCU off the west shore of Oahu. Canon 500D, Tokina 10-17mm, 1/160, f/9, iso 200. Even if the plan changes, the preparation process is key to making your pics pop. Part of the visualization process should include a behavior that the turtle is exhibiting. Below is a short list of the most common behavioral opportunities pertaining to turtles and how to up the chance for success. Anywhere turtles are seen frequently provides an opportunity to observe them lying about. However the award for the laziest turtles might have to go to a pair that hangs out on the stern of the wreck of the YO-257 on Oahu. It seems that if they aren’t on the deck itself, they are usually lying out in a hold somewhere or heading to the surface for a breath. If the latter is the case, just sit tight - they’ll be back shortly. Hawaii is one of the only places (in addition to the Galapagos and Australia) where green sea turtles are known to bask on shore. People frequently mistake these beached animals as injured or laying eggs. More than likely, the turtles are thermoregulating or even just taking a break. They make for engaging and unique over/under subjects when entering or leaving the water or even to set off a pretty sunset. When preparing the shot, keep in mind that laws prohibiting harassment of sea turtles extend beyond the water’s edge. Favorite basking beaches can be found at Puako, Honaunau and at various beaches on the north shore of Oahu. When they aren’t resting or lying around on a beach, turtles are generally stuffing themselves with marine salad. 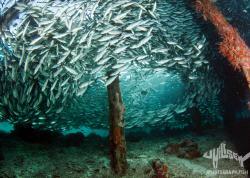 Often, they can be found feeding in shallow water where the rocks meet the ocean. The good news for shutterbugs is that the turtles are often so engrossed in their food that they forget their surroundings. Therefore, macro shots of turtles munching on rock fuzz are an easy way to snag a last-minute shot at the end of a dive. As much as they would rather remain motionless on the bottom or gorge themselves on seaslime, turtles have to go to the surface to breathe every so often. 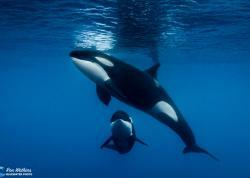 When this happens, they take one or two breaths and disappear beneath the surface. The two ways to get this shot are while wading in a shallow, protected embayment or spotting one from a boat. The turtle should be positioned such that it is facing toward or lateral to the lens. Be ready with a long lens focused on the spot they are likely to come up because the breath will last only a quick second. Much like neighbors who refuse to mow or rake their lawns, turtles don’t clean themselves. 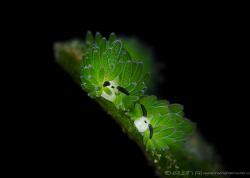 Instead, the other reef inhabitants take the task on themselves. Most congregations of turtles have a resident cleaning station nearby. Because yellow hues show up brightly underwater, it is visually optimal to target cleaning stations with a lot of yellow fish. In Hawaii this means yellow tangs (Zebrasoma flavescens) that are most abundant on the Kona coast. Be wary that the tangs will scatter quickly, so act fast with the wide-angle lens. Get lucky. Breeding occurs in the springtime. That’s about all the help anyone can give. This pair of sea turtles were found mating offshore from Kihei, Maui. Note the male’s front flipper claws gripping the carapace of the female. The coupling lasted only for a few minutes before they parted ways. Canon A650is, 1/250, f/4, ISO 160. The vast majority of nestings in Hawaii occur at French Frigate Shoals, an atoll that sits in a protected section of the Northwestern Hawaiian Islands. That means that the same turtles that are visiting tourists at Waikiki Beach swim 500 miles to this remote location every year to lay eggs before swimming all the way back to Oahu. Recently, and for the first time in decades, turtles have been observed nesting on the islets surrounding Oahu in June and July. Many of these small islands are off limits to the public, so these episodes are best witnessed from nearby shorelines and small boats. While green sea turtles are common in Hawaii, there are several other species that prove just as interesting. All of the species mentioned below have been found in Hawaii, but are much more rare than their “green” cousin. Hawksbills are extremely rare in Hawaii and considered critically endangered throughout the rest of their range. They can be distinguished from greens by having a curved beak, flatter shells, and overlapping scutes where the carapace (dorsal shell) and plastron (ventral shell) meet. They are endangered because they historically supplied much of the world’s need for tortoiseshell and have yet to recover. Their strange diet is comprised mostly of sponges. The Caribbean and western Indian Ocean (and Red Sea) remains some of the more common places to encounter hawksbill sea turtles. 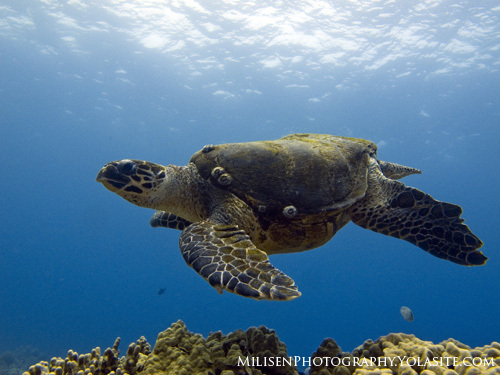 Hawksbill sea turtles are rarely seen in Hawaii. This older specimen was observed just inside of the boat channel at Honokohau Harbor, Big Island. Canon G12, 1/80, f/8, iso 125. Loggerhead sea turtles are no strangers to life in the open ocean but can also be found in shallow coastal environments. They come ashore only to lay eggs. Loggerheads are notable for having blunt snouts and small plastrons (ventral shells). Food items include most animals they can catch. Frequently this means sessile, shelled organisms like gastropods and crustaceans. Females will often battle it out over territory in a ritual that escalates into biting at each other. The best place to visit loggerheads is off the coast of the southeastern United States and along the Gulf of Mexico. This is the largest sea turtle with an average size over 6 feet long and the largest on record being almost 10! Leatherbacks are very rare, and encounters with divers do not happen often. They have a skin covering on their massive carapace and an overall black appearance. The leatherback’s mouth is full of sharp protrusions that point backward helping to guide jellyfish - its spicy food of choice - down its throat. They are one of the world’s few living giant reptiles and as such they are not likely to be confused with other sea turtles. 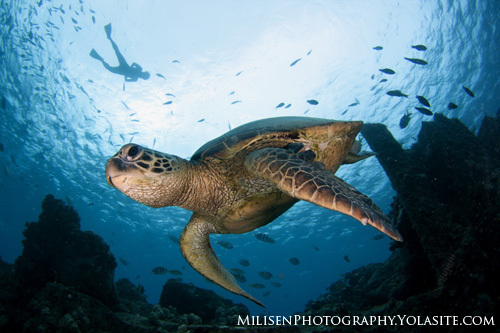 Underwater Photography Guide readers would do well to follow another practice set by sea turtles. They may devote a few hours here and there catching sunrays on the beach, but the vast majority of their time is spent living life under the waves. Chances are good that your vacation would be better occupied off the beach than on it, dragging a camera in tow and working to capture a mind-blowing image of one of the ocean’s most charismatic reptiles. Aloha. 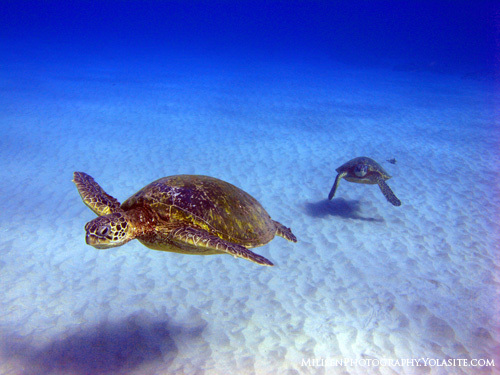 A pair of sea turtles cruise over a sandy area outside the warm water discharge site at Kahe Point, Oahu. Canon A650is, 1/40, f/8, iso 80.